When I go shopping for a new knife, I always get excited- which brand will I choose? Is there a new knife out there that I’m not familiar with? Does it have superpowers? Will I be able to cut 1,000 onions in a single bound? Well, probably not, but I sure am going to have some fun picking out a new model. “I’m here to buy a new knife,” I replied. You see, the week earlier I made the mistake of running my Shun Chef’s knife through an automatic Wusthof sharpener. The sharpener destroyed my beautiful knife, taking small chunks of steel from it, as if it were taking small pieces of my heart. I could repair it with my sharpening stone, but it would never be the same. As I looked through the protective glass at all of the shiny high-carbon stainless steel, I knew picking a new knife would be a difficult process. You see, this new cutting implement would soon become a part of me- an extension of my being… it had to be perfect. I was very happy with the cutting capabilities of my old Shun, so I decided to opt for another one, except this time it had to be bigger. She pulled it from the secured glass case. The steel was room temperature, and felt at home in my hand. The balance was spot-on, and the polished wood handle was blemish-free. I continued to inspect the knife… it was nice, but not extraordinary. Silly question, of course I want to cut something…. The saleswoman quickly appeared from behind a counter with a large oak cutting board, and fresh Vidalia onion. She placed them in front of me and smiled as if to say, slice away! Before I began to cut, one of the floor managers approached and said, “We usually don’t do this for customers”, then shot me a frown. So, is she saying that I can’t cut my onion? I sure hope not. I became a little annoyed; surely this manager wasn’t aware that I had bought a thousand dollar mixer a few weeks before. I mean, that entitled me to some special treatment right? “Today, we’re gonna break the rules,” I said, and began cutting. The manager scowled. The knife made short work of the onion, and I was sold. Just before making my final decision, something caught my eye from the knife case… a silver brilliance. The shimmering steel was mesmerizing. Horizontal sloping lines beyond the mirror finish, one after another, revealed folds of once-hot fortified metal. These wondrous pleats of steel were hand-crafted by a skilled tradesman, ensuring strength and longevity. Above the perfectly polished steel cutting surface lay a hammered finish. 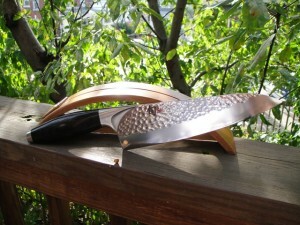 The dimpled top portion of the knife was also meticulously finished, creating a cohesive and fluid profile. An impeccably polished PakkaWood handle concluded the design. As the saleswoman wrapped my Shun, I began to smile. I had found my new knife, and soon it would be home. Did I mention that it came with its very own bamboo stand? While functional as a knife, it seemed better suited for a museum, on display for the world to see.